Charbonneau Arts Association President Eric Hoem enjoys seeing young people who are passionate about their chosen craft. art. That's where the Charbonneau Arts Festival can help. 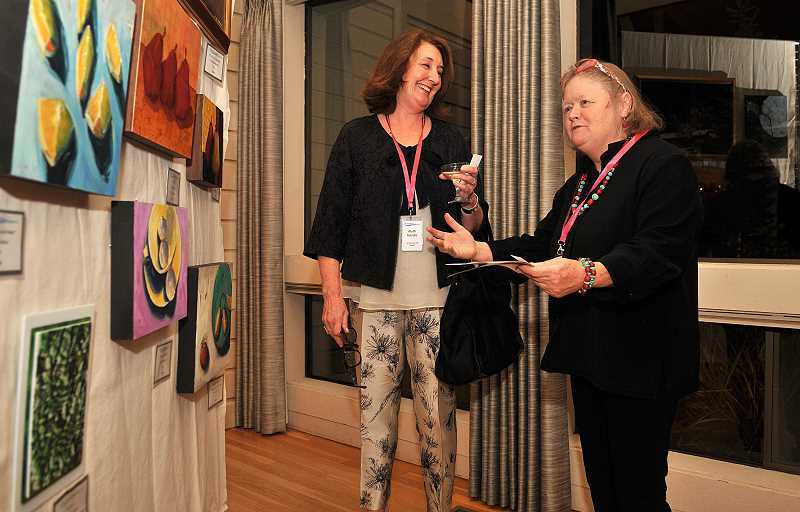 The 35th annual festival, which will take place Nov. 2-4 at Charbonneau Country Club, donates all of its proceeds to Wilsonville High School and Canby High School art programs. "Our mission as an organization is to help support the art programs, to give them a chance to do extra things, buy equipment," Hoem said. "In the case of Wilsonville they use money to go to a regional art contest. Canby in the past has done things like buy a digital camera ... extra things they get to do that they can't afford." This year's festival will feature 41 professional and amateur artists as well as student art from the aforementioned schools, a champagne reception and silent auction Friday, Nov. 2 at 6 p.m. and an Artisan Festival Nov. 3-4. Tickets cost $10 in advance or $15 at the door. For more information, visit www.charbonneauarts.org. Watercolorist Holly Kroening, who won the "People's Choice" award at last year's festival for displaying the most popular artwork, is the festival's featured artist this year. "Her pieces really said 'Hey come and look at me,'" Hoem said. "They're big, bold, dramatic and eye-catching." Hoem said oil paintings, watercolors, stone sculptures, metal sculptures, acrylics and many other forms will be on display. "I like the variety so people see a lot of things that just interest them," he said. "That's what is attractive about art: 'Oh I wonder how they did that? I want to look at that closer.'" About half of the artists are Charbonneau residents, which Hoem said is a testament to Charbonneau's vibrant arts community. "We have people who have taken it up as a hobby and become very proficient and people who are selling art throughout the region," Hoem said. "Charbonneau is not a retirement community but because it has a golf course community it attracts people around that age. Retired people look for things to do besides playing golf." Along with artwork from about 50 students, select students will perform art demonstrations throughout the festival. "We enjoy having them demonstrate. A lot of times people come away from the show seeing the student art as their favorite part," Hoem said. The Artisan Festival will include handcrafted skin lotions, yard art, glass decorations and other handmade creations. Aurora Vineyards will hold wine tastings on the weekend and the silent auction, where things like hotel stays and rounds of golfs will be up for grabs, will offer hors d'oeuvres. Lastly, pianist Marilyn Anderson will perform throughout the weekend. The festival, which is led by volunteers, raised $3,000 for art programs last year and Hoem hopes to im-prove on that total this year. And they're off to a good start, receiving $6,000 in sponsorship funds prior to the festival. "It's that kind of community support that makes something like this happen," Hoem said.